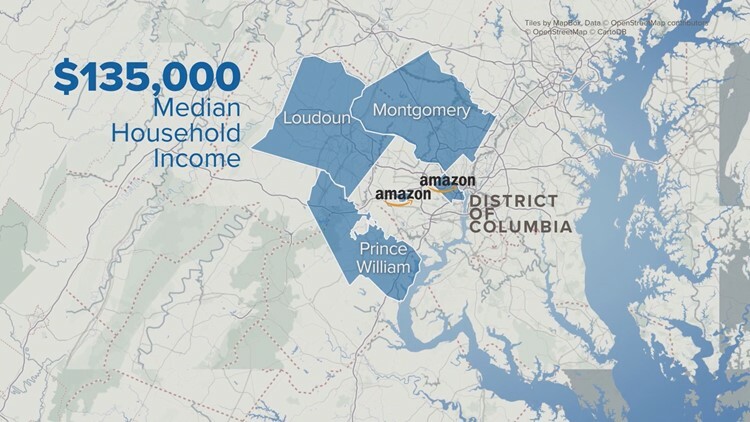 The Amazon Effect | Will HQ2 cause the homeless population in the DC region to grow? In the last eight years, Arlington County has reduced homelessness by 60 percent. All this week online and at 11, we're digging into the Amazon Effect. WASHINGTON — Amazon's decision to locate its new HQ2 in Northern Virginia will transform the D.C. area. Along with the promise of 25,000 high-paying jobs will come more expensive housing, and possibly, more people priced out of homes, and some, falling through the cracks. Seattle, where Amazon is based, has a huge problem with homelessness. Will Seattle's problems become ours? In order to understand the potential impact on homelessness in the D.C. area, we headed out west to Seattle where the problem is getting worse. In Seattle, there’s a landscape littered with tents. 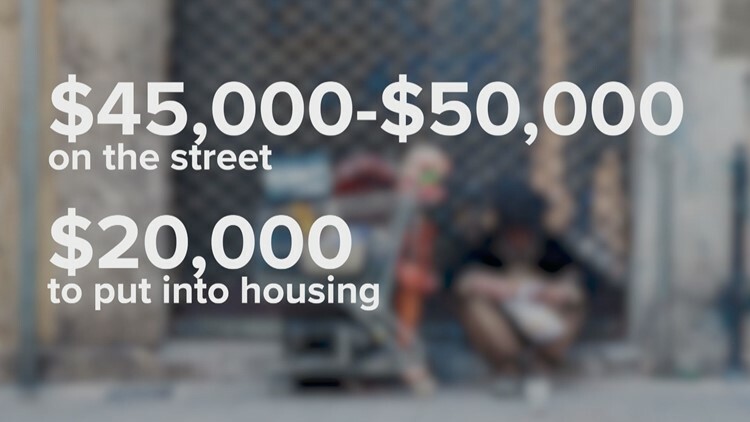 With more than 12,000 documented homeless people either living on the streets or in shelters, Seattle has the third largest homeless population in the United States, and that number is growing, according to the Executive Director at the Low-Income Housing Institute Sharon Lee. "We have so many people that have fallen into homelessness or at the very edge of becoming homeless because of rent increases, they are literally being squeezed out of the homes that they have lived in for 10-20 years,” said Lee. Lee doesn't blame Amazon for causing Seattle's homeless problem but believes the company's explosive growth has made it worse. "There's this tremendous influx of high way workers, and many of the are being field by Amazon and the other tech companies, and the affordable housing stock has not kept up,” said Lee. Despite declaring a state of emergency in 2015, Seattle's homeless population rose from 10,047 to 12,112 in 2018. Then, last summer, the Seattle City Council passed a controversial head count tax to raise millions to fight homelessness. It would have levied a $275 per employee tax on Seattle businesses making more than $20 million a year. A month later, the same council voted to repeal it. Amazon, which would have been subjected to the head count tax, fought it and helped kill it. “Why would a corporate leader bully the city, when the city is trying to end homelessness,” Lee asked. Amazon claims that tax would have been counterproductive. "We stand by our decision to oppose the head count tax,” said Allison Flicker, Amazon Corporate Communications. “A big reason for this decision, the primary reason is that we did not think this was supportive of economic prosperity. We also did not feel like the plan that was laid forward would actually fight homelessness." RELATED: What did Seattle wish it knew before Amazon moved in? Amazon said it has invested $40 million supporting local groups fighting homelessness. That investment includes a new eight-story home Amazon is building for a group called Mary's Place, which offers services and support to homeless families. So here's the question for the DC. Area? Will Amazon bring with it, a rising homeless population? "The circumstances are very differences in Arlington than they were in Seattle,” said Arlington Board Chair Christian Dorsey. Dorsey said no, because the economic conditions are very different. "Amazon grew a lot in Seattle. I mean the population there grew 40 percent at the same time Amazon was founded,” said Dorsey. “It's not expected to have anywhere near as big an impact on our area in terms of the population growth." Amazon said it's bringing jobs with six figure salaries. The D.C. Area already has that. In fact, the richest county in America is in Loudoun County, Va. with a median household income of more than $135,000. The other counties in the Top 5 include: Fairfax and Arlington, where Amazon will locate. Prince William and Montgomery counties also boast six figure median incomes. 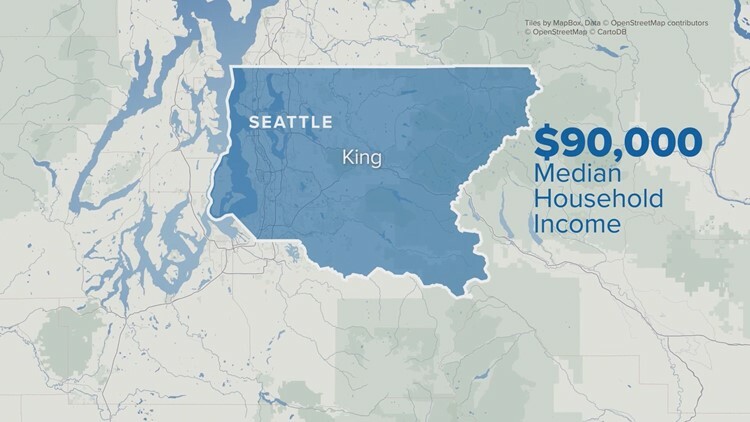 King County where Seattle is, has a median income of about $90,000. In Arlington County, officials said they're way ahead of the game in curbing homelessness. Over the last eight years they have reduced it by 60 percent. And, it was one of the first in the country to functionally end veteran's homelessness. It means they have the resources in place to get a homeless veteran into a home within one year. Army veteran Ricky Andrews has his own apartment after living on the streets for a decade. They did it with a Housing First strategy run by A-SPAN, which operates the Homeless Services Center for Arlington County. Kathy Sibert is the president. “Really to end homelessness, it's not that complex,” said Sibert. “You have to move someone that's homeless into a home. Because then they are no longer homeless. And we've had terrific success." While it sounds expensive to house homeless people, Sibert said it’s half the cost of having them on the street. Ricky's pension helps pay for the rent, the rest is subsidized by the A-Span. "It costs about $45-50,000 if they're on the street,” said Sibert. “They're using the emergency room for medical care and when they get there, most of the time, they're hospitalized because they haven't gotten any medical care." "It costs about $20,000 if we put them into housing. Including rent and case management,” Sibert also said. RELATED: The Amazon Effect | Will 25,000 new jobs make it impossible to get around? What A-Span does is replace expensive hospital costs homeless people use, with regular health care and a case manager who looks after them until they're on they're self-sufficient. While Arlington said they've got a handle on the homeless problem, they are worried about one thing with Amazon coming. "What I'm worried about is the impact on affordable housing here in Arlington County,” Sibert said. “Because in order to do what we're doing, we need a constant supply of affordable apartments here in Arlington." In the entire D.C. area, there is a shortage of affordable housing. Arlington Board Chair Christian Dorsey said they plan to stay ahead of the problem. "Part of what Seattle, unfortunately wasn't able to do, was to grow the housing supply to meet the rising number of workers,” said Dorsey. “We already know we need to do that because we've had an affordable housing problem already. So we expect that we're going to be able to manage Amazon's growth here a lot differently." He said the plan aligns with the lessons learned from the Seattle experience. “We don't want to be in a situation that they have seen with Amazon. We want a very different outcome and we're preparing for it,” Dorsey said. One thing Dorsey pointed out that's different with Seattle, is that Amazon is moving into vacant buildings. They're filling a huge hole that was left when Crystal City lost 25,000 federal jobs. Amazon is bringing that same number of jobs over the next 12 years, so officials think the D.C. area will have those gentrifying shocks that took place in Seattle.